As advance security forces invaded the Vienna Ritz-Carlton ahead of a Putin visit next week, 40 Philadelphia Orchestra members were exiled to the nearby Hotel Intercontinental before ending the European leg of their tour with concerts Thursday and Friday in the city’s hallowed Musikverein. Little did the Russian strongman know that he gave the Philadelphians an opportunity cherished on symphony orchestra tours: The Intercontinental Hotel promised free laundry. After a sweltering concert inside the Musikverein, principal flutist Jeffrey Khaner was at the hotel desk inquiring what the exact drill was to get his clothes back before the tour moved on. Friday had one of the loudest ovations one is likely to hear from usually reserved, super-sophisticated Vienna. Such concerns signal a return to relative normality on a European tour where the opening concert May 24 in Brussels was interrupted, inside the hall, by a Boycott, Divestment, Sanctions (BDS) demonstration trying to pressure the orchestra to cancel the Israel leg of its 12-day tour. Pro-Palestinian demonstrators in Philadelphia had likewise disrupted a May 19 performance of Tosca at the Kimmel Center as a sendoff just before the tour. Similar protests had been anticipated in the subsequent European cities — all told, the orchestra played eight performances in six European cities, including Luxembourg, Paris, Dusseldorf, and Hamburg — but the small groups of protesters who materialized outside several of the venues stayed outside. 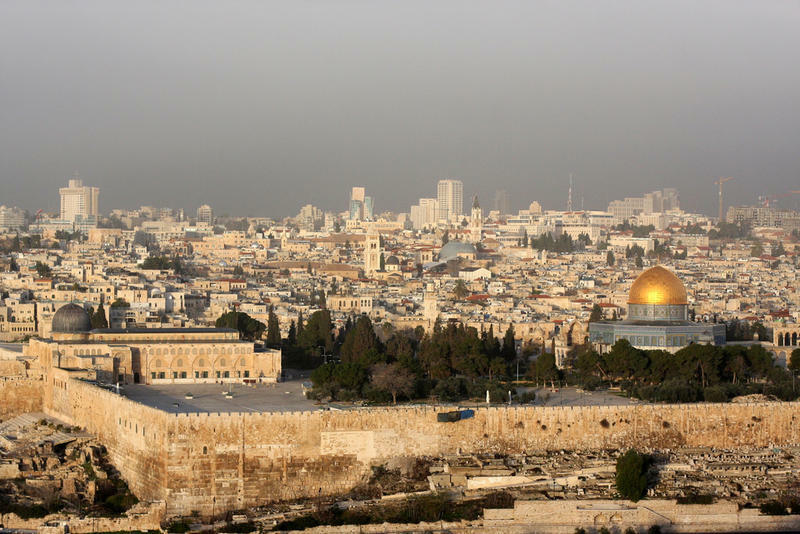 Simulcasts of concerts from Israel on WRTI 90.1 include Tel Aviv on June 4 at 2:30 PM, and Jerusalem on June 5 at 2:30 PM. The Vienna concerts — the last before flying out to Israel for performances June 3 to 5 — might’ve been the opposition’s last stand. Instead, nothing. On Thursday, with plenty of police standing by, two protesters were outside the Musikverein. On Friday none were. On both nights, a pre-concert announcement requested that if anybody inside the hall had anything to protest they do so now before the music started. On both nights, audience reaction to the playing itself was extremely positive. Guest artist Helene Grimaud’s Brahms Piano Concerto No. 1 seemed to leave the Thursday crowd astounded at the depths of her artistry, as it reportedly has on other stops of this tour. Friday had one of the loudest ovations one is likely to hear from usually reserved, super-sophisticated Vienna. All but one of the orchestra’s eight performances in the six European cities sold out, and the outlier was at 95 percent of capacity. After the Brussels disruption, the orchestra had announced plans to leave the stage momentarily if protests disrupted another tour performance, resuming the concert afterward, but the policy never came into play. “Upsetting, but not threatening,” is how violinist Paul Roby described the Brussels incident. He wondered whether audiences might have it worse than the musicians: They’ve spent lots of money to catch the orchestra on tour and don’t know whether an inside-the-hall protest might escalate. “It adds a layer to our understanding of that world,” said Israel-born cellist Ohad Bar-David. 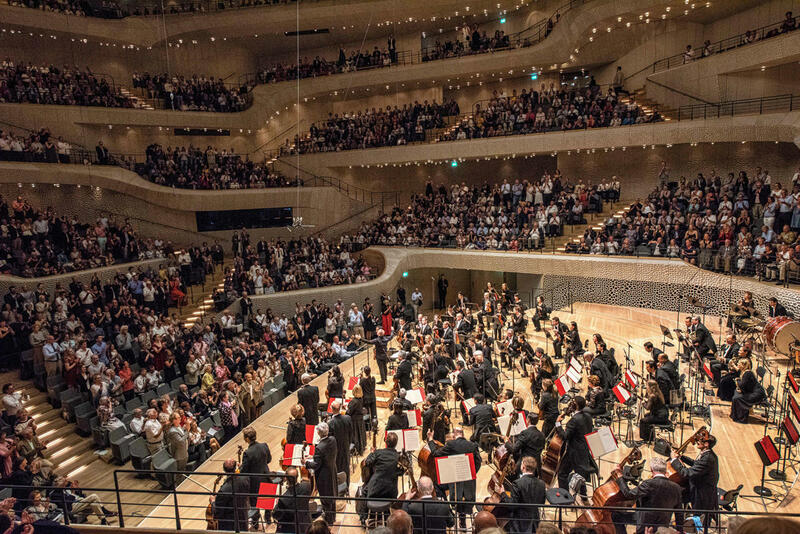 The Philadelphia Orchestra performs in Hamburg's Elbphilharmonie during its 2018 tour of Europe and Israel. In a private talk with the orchestra members during the Hamburg stop, music director Yannick Nézet-Séguin reportedly discussed the importance of solidarity, one musician describing it in the spirit of “We start together, we end together” (as in any good symphonic performance). Also, national anthems that were listed in the tour books for possible performance are not being heard. “It’s protocol to play anthems [only] when heads of state are in attendance,” said orchestra spokeswoman Ashley Berke. Often-obligatory backstage photos with important governmental figures are being avoided, according to sources. More than a few musicians feel their tour is being used to further all manner of agendas on all sides of the political issues. The absence of anthems and photographs should help minimize that — while also freeing the musicians for the considerable work at hand. 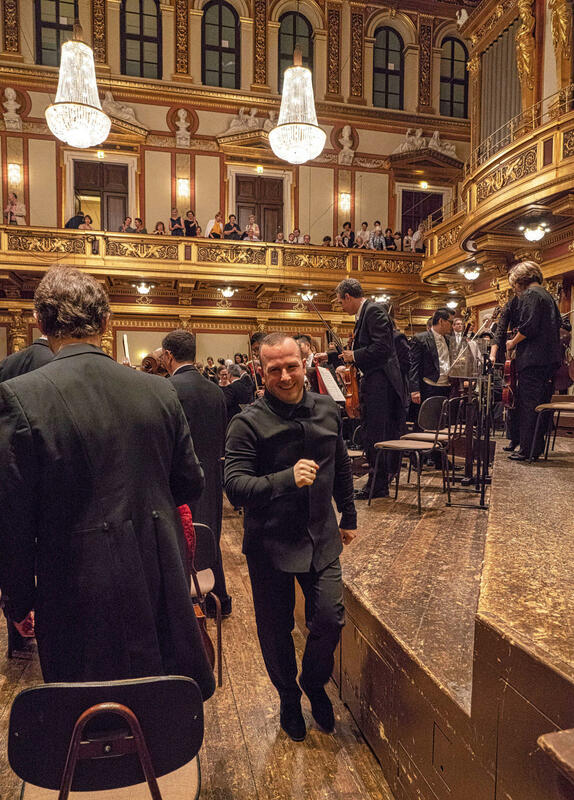 In Vienna, Philadelphia Orchestra music director Yannick Nézet-Séguin exits the stage following the Philadelphia Orchestra performance. Spirits are always high in Vienna. In an unguarded moment during rehearsal, Grimaud appeared to be beaming at the piano in front of her. 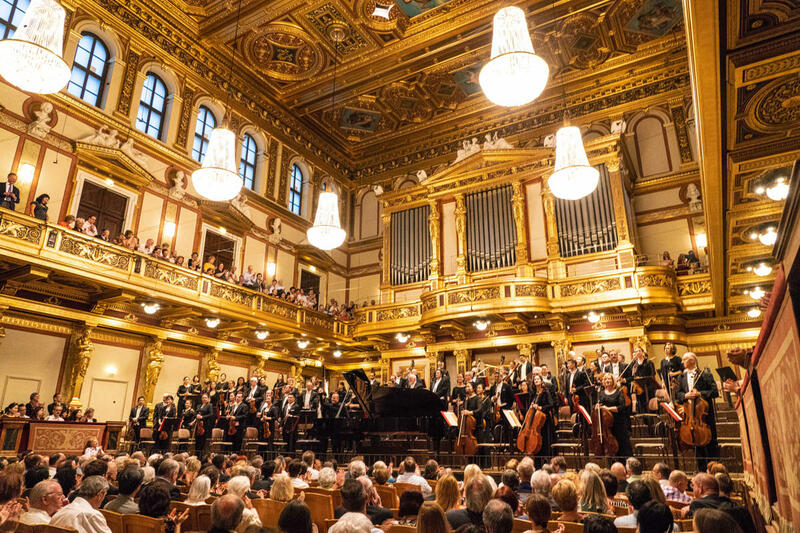 “There’s clarity but this wonderful sheen and resonance to everything happening onstage,” said assistant conductor Kensho Watanabe, who was at the Musikverein for the first time and hearing Brahms in a venue the composer himself frequented. Amidst it all, the renewed fighting between Israel and Gaza and the tour controversy that came with it has caused some of the musicians to re-assess their place in the world. 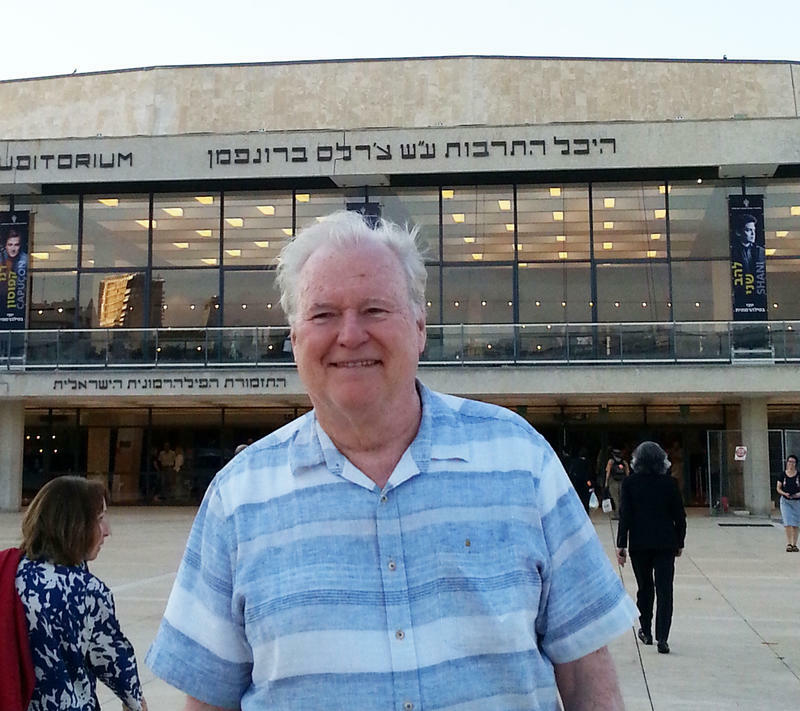 Violinist Philip Kates is rereading James Michener’s The Source (a historic novel about the history of Israel) and is planning an outreach concert in East Jerusalem at the the Spafford Children’s Center, a health center for disadvantaged children. David Patrick Stearns will report from the orchestra’s tour through June 7. David Patrick Stearns' coverage of The Philadelphia Orchestra on Tour is made possible by a partnership between the Philadelphia Inquirer and WRTI. Pianist Jean-Yves Thibaudet talks about playing Bernstein's The Age of Anxiety in Israel. Philadelphia Orchestra Concertmaster David Kim talks with WRTI's Debra Lew Harder about touring adventures and playing in Israel.